For many early-stage medical device companies, the default option when implementing a quality management system (QMS) is what they perceive to be the “cheapest” - paper. To avoid limiting factors like these, implementing a robust eQMS software platform can enable companies to decrease costs surrounding risk and QMS upkeep, while increasing the company’s overall efficiency and ability to scale. 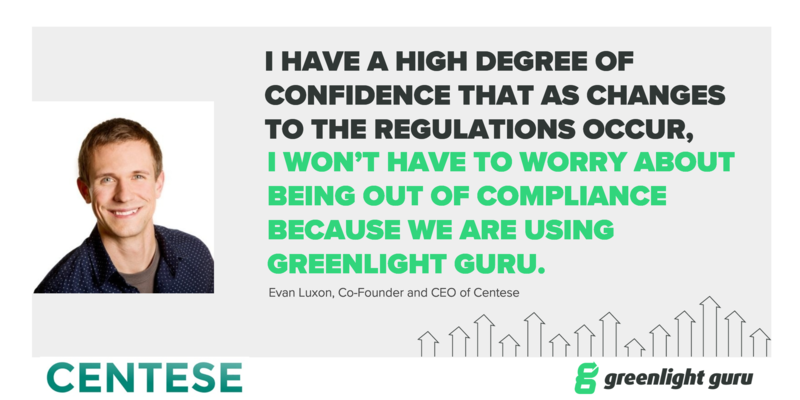 We recently spoke with Evan Luxon, CEO and co-founder of Centese, to learn more about their switch to Greenlight Guru and why they wanted to avoid the price of inefficiency. Centese is an early-stage medical device company based in Omaha, Nebraska that is working to increase the safety, intelligence, and efficacy of post-operative surgical drainage systems. Their device, Thoraguard, is an intelligent surgical drainage system that automates drainage management and collects data for surgical teams to better monitor patient recovery. The Centese team is led by Evan Luxon, who has significant experience leading commercialization efforts at early-stage medical device companies. In addition to leading Centese, Evan is also a partner at TheraNova, a medical device incubator focused on developing innovative new medical devices. Through the work being done at TheraNova, an opportunity was identified to spin-out a new company focused on post-operative surgical drainage. The team at Centese is on a mission is to give cardiothoracic surgical teams a better option for post-operative drainage in order to improve patient outcomes and decrease the total cost of care. When starting Centese, Evan felt that the QMS being used at the previous TheraNova spinout would be too “heavy weight” for what he wanted and require excessive time to implement for Centese. Similar to many early-stage companies, Centese initially reverted back to a paper-based system in order to establish the core of their quality system with SOP’s and quality manuals. Evan knew that a paper-based approach to quality was not the long term answer, as it would not allow the company to maximize team members’ time, set the foundation for a culture of quality, or scale effectively. After establishing a paper-based QMS as a baseline, Centese immediately began searching for a solution that was nimble and allowed them to manage the QMS in an efficient manner that could grow with their company. The team at Centese had been using Excel to manage their design controls and risk management, but it was “a huge pain.” Managing and updating their spreadsheets, while documenting the changes to maintain traceability required tedious and time consuming efforts. This burdened their team with administrative work, rather than allowing them to focus on value-added activities. Evan’s main goal was to find an eQMS solution that would minimize these time-intensive manual processes and allow the team to focus on high-impact work that would positively impact their 510(k) clearance timeline. 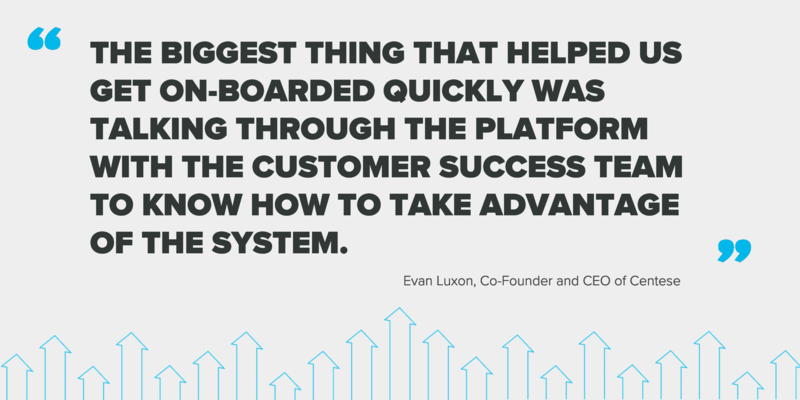 To find the right eQMS platform, Evan began researching solutions that were a good fit for medical device companies. He then discovered the work of Greenlight Guru’s founder, Jon Speer. After reading his blog posts and ultimate guides, Evan was intrigued to find out if Greenlight Guru could be the right fit for Centese. After taking a product tour and seeing firsthand how Greenlight Guru could streamline approval processes, revision control, and system wide traceability, he knew it would be a good fit. Click here to learn more about Greenlight Guru's Advanced Document Management software. 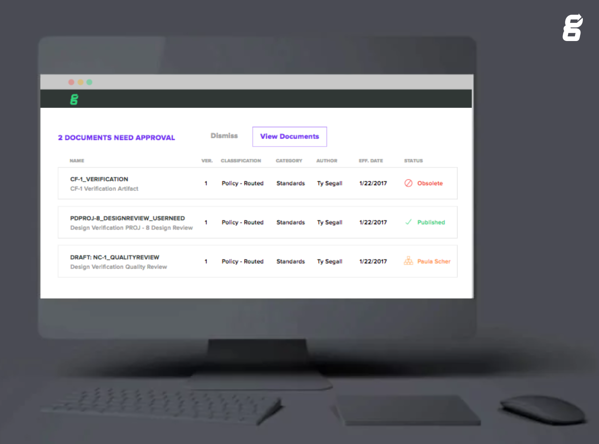 Evan recalls that it was “icing on the cake” when he saw Greenlight Guru’s tightly integrated Design Controls and Risk Management functionality that would allow the team to streamline product development efforts and expedite their 510K submission. The team at Centese realized that Greenlight Guru was going to give them the solution they needed to refocus their efforts on value-added activities. Rather than creating a new position or hiring a part-time employee to provide oversight for a paper based quality management system, Centese realized that a QMS software that was purpose built for medical device companies would allow Centese to be both resource and capital efficient. For Centese, transitioning their quality system from a paper-based world to Greenlight Guru was very straightforward. Only minor changes were made to their existing procedures in order to align with the workflows in Greenlight Guru’s software. Greenlight Guru’s Customer Success Team made up of medical device industry experts helped Centese adopt the recommended workflows that they would be using on a day to day basis. They also took the time to assure Centese quickly understood how the software was designed and could be used to achieve their desired outcomes. Centese was able to quickly realize value after a short onboarding period and avoided lengthy implementation and training timelines that are common with many general purpose software solutions. The entire team at Centese is now leveraging Greenlight Guru’s advanced document management capabilities in their day to day activities. Adopting Greenlight Guru helped Centese avoid hiring at least a half-time employee to oversee and manage their quality system. It also helped them refocus their time on value-added content and activities rather than administrative tasks that would have been necessary to demonstrate compliance if they’d taken a paper based approach to quality. The time savings that Centese realizes will compound as the size of the team grows and their quality system gets larger. Evan can also attest that managing all of their design control and risk management activities within Greenlight Guru streamlined their product developments efforts to help them achieve 510(k) clearance in November 2018. They are now focusing their efforts on three post-market clinical studies that will give them initial clinical experience with feedback from top notch centers across the United States. The efficiency, risk mitigation, and reduced overhead costs associated with managing the quality system that Centese is realizing is the primary reason why Evan continually recommends Greenlight Guru. Compared to a paper-based or ad-hoc system, Greenlight Guru allows the team at Centese to be nimble in their development and work more efficiently as they begin to scale. Evan and the team at Centese view Greenlight Guru as a trusted partner in a medical device regulatory environment that is rapidly changing. Between the software platform and medical device quality and regulatory experts offered by Greenlight Guru, Evan knows that his team has trust in their ability to navigate the evolving regulatory climate. He also finds it extremely valuable that if he or his team have questions about the software or quality and regulatory topics, they have access to Greenlight Guru’s medical device experts who are always willing to answer their questions. Now that they’ve received 510(k) clearance, the team at Centese is working on a soft commercial launch of their device in high impact centers of influence around the United States. With Greenlight Guru, Centese has a quality system that enables them to serve the US Market while also preparing them to easily navigate the regulatory requirements as they expand into other international markets.